Fieldstone Farm of Rindge, NH - Buy Maple Syrup Online. Ship via USPS. 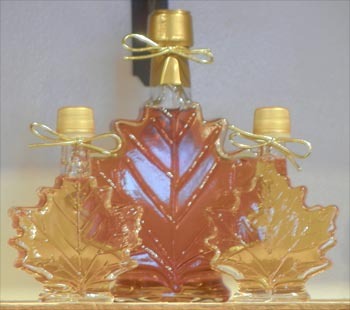 At Fieldstone Farm you can order maple syrup online. For Plastic jugs you can pick your choice of grade. For the glass bottles, the grade is pre-selected to bring out the aesthetics of the bottles. Our website lets you pay by Paypal. If you would prefer to do it the old fashioned way though, click here to get our order form to send via the US mail. Our shipping charge is based on weight. If you shop via Paypal, when you add an item to the cart, it will open a paypal cart in a separate browser window or tab. If it seems like nothing happened after clicking one of the buttons, look for another browser window on your taskbar. If you are interested in ordering syrup in custom bottles for your wedding, baby shower, or other special event, be sure to contact us. See some samples here. Starting with the 2015 sugaring season, sugarhouses across NH have switched to a new grading system. This has no effect on how sugarhouses produce the syrup; rather, it is intended to assist the maple syrup consumer to better understand the what each grade means. If you've enjoyed some pure maple syrup before, you know that all the grades taste great! As a general rule, the syrup starts lighter in the beginning of the season and gets darker as the season progresses. Grade A Golden Delicate Taste Comes from the earlier part of the season. It has a very delicate maple taste that is often used for making maple candy. Grade A Amber Rich Taste has a slightly stronger maple flavor than Grade A Golden Delicate Taste. For many maple syrup consumers this is "classic" maple syrup flavor. Grade A Dark With Robust Taste is a slightly darker looking syrup with a pronounced maple taste. This is the new name for what many maple syrup connesuers prefer for pancakes, waffles, etc. Grade A Very Dark Strong Taste is often used for cooking dishes with a maple flavoring - the strong maple flavoring will carry through to the finished dish.